Air conditioning cools air and provides relief from sweltering summer heat. A good air conditioning unit can also improve air quality by balancing temperature and humidity in the home. Certain units may also purify the air, keeping it clear of potential allergens. Newer air conditioning units are energy efficient systems that used energy smartly and efficiently. Not only do these systems protect the environment, they also help homeowners keep energy bills under control. There are a number of air conditioning units available for UK homeowners, although they generally fall into three general categories. Certain air conditioners may also feature a heat pump. These systems can be switched each season to provide heat during colder months. Air conditioning controls are typically found on the unit itself or on a central wall-mounted control panel. Some systems may also feature a handheld remote control. Easy-fit air conditioners require no outside space and offer a simple cooling solution for a single room. They are easy to install and allow homeowner to separately control temperatures in individual rooms. These units can be fitted in a window or wall opening. They may also be portable devices that occupy floor space in a room. Easy-fit air conditioners are generally more affordable than other systems, such as a split system. Split systems are the most common type of air conditioning system. A refrigeration circuit is split into two halves between an indoor unit and an outdoor unit. The Indoor portion of the system is generally subtly designed to suit the interior of a home and features a fan. It may also include a heat exchanger. Indoor units can be mounted on a wall or free-standing. The interior unit can also be concealed in an attic space or other enclosure. Outdoor units are used to dispose of heat and are placed on a patio, a porch or the ground adjacent to the house. A multi-split system is used to cool multiple rooms. Although there is one outdoor unit, each room will have an interior unit. 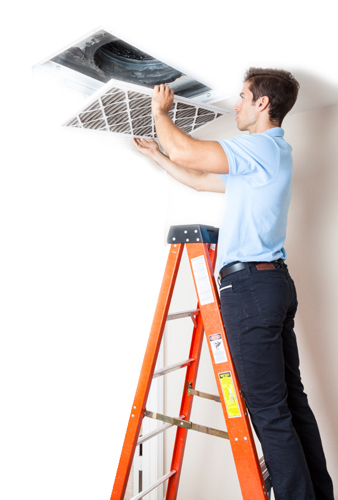 Central air conditioning or ducted systems provides cooling for the whole house. This type of system is generally a more affordable option than having units for individual rooms or split systems for multiple rooms. Unlike a split, a heat exchanger is located inside a central air conditioning unit that is used to distribute cooled air throughout a property. An outdoor unit is used to expel excess heat. While some portable and mounted air conditioning units can be installed by homeowners, other systems require a trained installer. Air conditioner installers can also design bespoke systems for new homes to ensure properties have the best possible air quality and temperature control. Many air conditioner manufacturers maintain registers of approved installers and companies. Some manufacturers may not honour equipment warranties if units are installed by non-authorised companies. Hiring a registered installer will ensure that you are working with someone who has knowledge of building regulations and experience in installing units that meet safety and manufacturer standards. Installers should possess Refrigerant Safe Handling certification. It is also a good idea to choose an installer that is registered with Refcom. Refcom offers government-recognised certification to ensure installers meet applicable standards and regulations. Refcom works closely with the Environmental Agency to certify installers and monitor compliance. In 2009, anyone who installs, maintains or services air conditioning and other refrigeration and heating equipment with F-Gas refrigerants must have an F-Gas Company Certificate. As of 2011, all businesses must also hold a Stationary Equipment Qualification Company Certificate (also known as a Full Company Certificate). This certificate demonstrates that the company employs trained personnel and has the necessary tools and skills to safely install, service and maintain air conditioning units. When choosing an installer, look at established companies with expert engineers. Also seek out installers who have experience in various types of air conditioning systems. Speak to friends and family about their experiences with air conditioner installers. Reputable installers will also provide warranties for their work and flexible servicing options.